Machu Picchu Ruins - What are those structure on the greens! 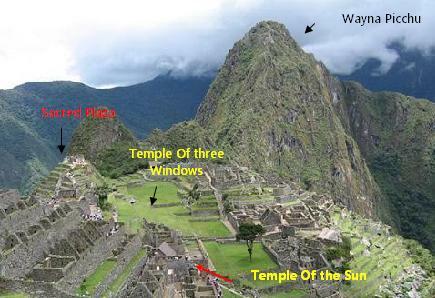 I guess each Machu Picchu visitor must have seen picture like this one before landing at Peru. 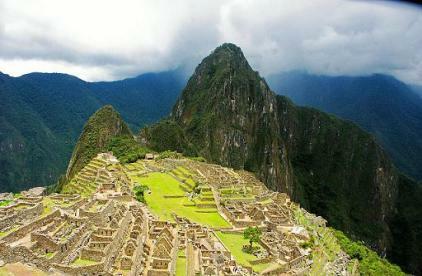 Picture of ruins inspired lot of people to visit Machu Picchu. Still when they reach this place they become stunned for some moment. Now what are those structures! Once you will reach that place your tour guide will certainly explain you every single structures. But sometime they go fast, and when you will reach there, you remain so absorbed, it is really difficult to concentrate on what somebody is telling (Hey, you are there to see something , not to eat lectures, right? ). I think you better get some idea of those elements before you reach there. It is not a big deal, just read this page, Certainly you don't have to memorize everything, or anything at all, just get some ideas. The tall mountain behind the ruins is Wayna Picchu. The far left is the sacred plaza, you will find Intiwatana there. Then towards the bottom of the picture you can see Principal Temple, the Temple of the Three Windows, and royal houses. Near the bottom the semi circular structure is the Temple of the Sun. On the middle and right around the main plaza are gardens, prisons and residence for common people. When you will enter Machu Picchu you will see this hut. From here you can see whole Machu Picchu. There is a big stone behind this hut, known as Funerary Rock. This rock is the place for drying bodies in the sun for mummification. It is a semi circular tower. Stonework of this tower is exceptionally good. Which indicates the importance of Temple of the Sun. You will see a curved rock at the center of the temple. This rock has a straight edge which is in line with the sunlight during summer time. Sacred Plaza is the important part in the ruins. You will see most of time a big group standing there (some how I got the picture when it was les crowded), listening the lectures of the guide. One group leaves another one comes. hitch the sun from going further away. Though in all Inca center they were found, they were not found intact. The Spanish destroyed most of the hitching posts. They had taken it as objects of pagan worship. Since Machu Picchu remained hidden to them, here Intihuatana remained intact. But you would laugh to know that after surviving all those centuries this famous Intihuatana was knocked down ( not whole though, only(!) the top) by a camera crew while shooting was going on for a beer commercial, in 2001. You will see this at the far end of Ruins where the entry Huayna Picchu is located. 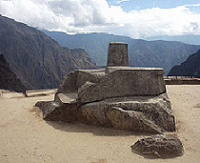 Incas always placed a sacred stone before the establish a new village or site. It is common in all Inca villages or towns. How much time you need to move around all the sections of the ruin. Though from picture it looks like a small place, practically it is not that small. And there are lots of things to see. 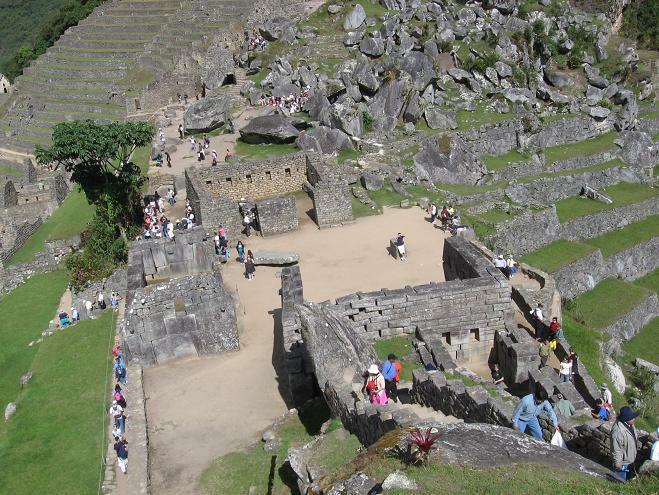 Many plazas, stones, agricultural sector, urban sector Wayna Picchu and what not. But still after all these you can finish your visit to the ruins in tow to three hours, if you like to go slow (of course, after traveling a lot) still you may need five hours, after then there will not be much things left for further study. But (yes, I have more things to say, sorry) if you are planning to see sunrise in Machu Picchu, or you want to climb onto Huayna Picchu, or you want to spend time in Machu Picchu when it is calm and less crowded, then, yes, then you should not go back on the same day. Spend at least a night in ruins, I mean the hotel next to the ruins, " Machu Picchu Sanctuary Lodge" (if you have a deep pocket), or in some other hotels on Aguas calientes. If you are interested to climb up the Huayna Picchu Mountain (the big mountain at the background of Machu Picchu ruins), you have to go there early, because only first 400 people are allowed to climb up everyday. So if you don't stay there at night, when you reach at the ruins there will be no space available for you. If you are in a travel package, or in a guided tour, you don't need to worry about buying entrance ticket, because your tour operator will take care of that part. But if you choose to travel yourself (which I recommend) then you need to buy the ticket yourself. Usually entrance tickets are sold at the entrance, right? But that is not true at Machu Picchu ruins. You have to buy the ticket at the Machu Picchu Cultural Centre in Aguas Calientes. So if you miss it and reach Machu Picchu, you have to come back again to Aguas Calientes. So please don't forget to buy it before you leave Aguas Calientes. Machu Picchu Cultural Center is at Main plaza of Aguas Calientes. You can ask any body there to reach there. One more thing is that, if you are touring independently don't forget to stop at Machu Picchu Pueblo Station. Those who are in a guided tour, usually stop at Puente Ruinas Station, since there guides already collect the tickets from Aguas Calientes. If you are staying at Cusco then you can buy the ticket from Instituto Nacional de Cultura (INC) office at Calle San Bernado , which is two blocks from Plaza de Armas of Cusco. Entrance ticket is around $40.00. For students there is 50% discount. Student s have to show ISIC card, any other student ID other than a ISIC card will not be accepted there. All this tickets are valid for one day only. So if you plan to come back next morning, don't forget to buy one more ticket.Read more on entrance ticket to Machu Picchu.